A Parking house is primarily a rational construction with the purpose of getting most cars as possible parked in the least space possible. A construction which often ends up as depressing and deserted backside to the city. With our facade design for the new parking house in Østre Havn, it has been our aim to create a simple facade which varies according to the light of the sun and sky. Which varies whether the facade is experienced in high speed through the front window of a car on Nyhavnsgade or by walking alongside the facade in Østre Havnegade. Which varies according to whether you watch it up close, from far away, straight on or from the side. The vision for the new parking house in Østre Havn is a building which creates a new urban nature which is full of life and which utilizes a range of sustainable solutions for the future. Located between Nyhavnsgade and Østre Havngade, the parking house has a robust construction from simple materials, in-keeping with the former industrial aesthetics of its harbour context. Its facades consist of a range of different extruded aluminium lamellas, which are easy to assemble, and therefore also easy to disassemble. This ensures that at the end of the building’s life all of the facade materials can be easily dismantled, and the aluminium can be recycled. The facades allow for natural light to penetrate into the building and are also ideal for external planting to take hold and grow up the external faces of the building. This greening of the facades unites the building with the masterplan’s wishes to establish a green buffer zone along the crowded Nyhansgade. Green facades absorb CO2 from the air, increase levels of oxygen and add a range of other positive environmental qualities to the city. Planting can also filter dust and pollution particles from the air and reduce the levels of road traffic noise experienced in the area. The green facades will also create a new habitat in the city, a mini ecosystem where insects and birds can thrive. This greening of the facades unites the building with the masterplan’s wishes to establish a green buffer zone along the crowded Nyhansgade. Surrounding the parking house, space is created for a range of different activities, such as basketball, skateboarding and a climbing wall. This ensures that the building interplays with its surroundings, not only functioning internally as a parking house, but provides for community and recreational activities – giving value back to the city. 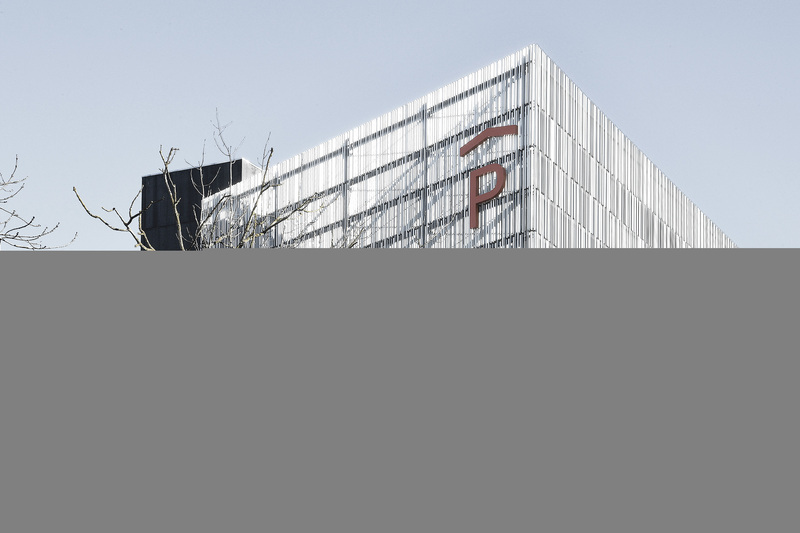 The parking house was awarded by Aalborg Municipality in 2018 for its light and graphical facade solutions. The parking house has a capacity of 590 cars.